Also see the C-50 and C-52 manual transmissions and the A245E automatic transmission. 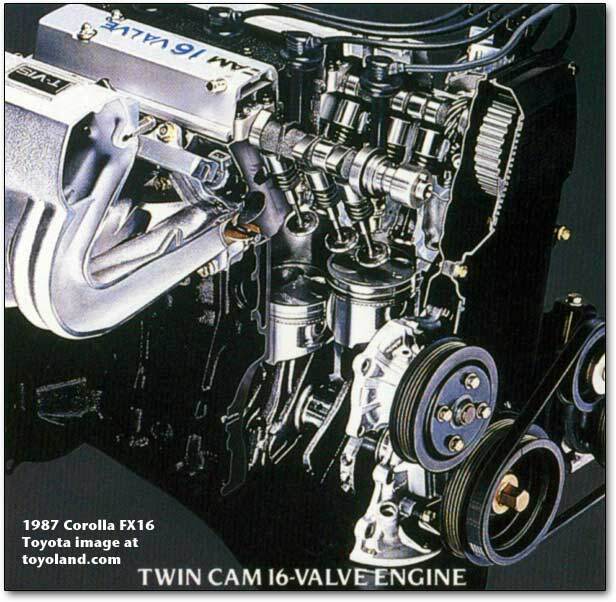 Corollas made from 1993 to 1997 had two engine choices, the 1.6 liter 4A-FE and the 1.8 liter 7A-FE (click here for many details, comparisons, and diagrams!). As emissions laws and tuning changed, horsepower figures moved around slightly, but not enough that the average person would notice: in 1993, horsepower was 110 hp at 5,600 rpm. By 1996, less peak power was available, but you could get it more quickly: 105 hp at 5,200 rpm. Torque went up by two foot-pounds in the same time, from 115 to 117. The convention for engine names is that the first digit (e.g. 1, 2, 4, 7) shows the generation of the engine within its design family; for example, the 4A had gone through several major changes, starting with carburetors, then fuel injection, then five valves per cylinder. The 1983 cars gained a new 1.6 liter 4A engine was introduced. The 4A had 1587 cc, bore and stroke of 3.94 x 3.03, compression ratio of 9.0:1, 70 hp @ 4,800 rpm, 85 lb-ft @ 2,800 rpm in 1983. The 1.6 liter 4A-GE was a higher-compression (9.4:1 rather than 9.0:1), electronically fuel injected, 16-valve version of the 4A, with 112 horsepower and 97 lb-feet of torque. This latter engine used dual cams, a central spark plug (“semi-hemi”), and variable induction - a series of valves in the induction ports to improve intake velocity at low engine speed, andincrease airflow at higher speeds. An oil cooler was standard. Transmissions used with the 4A-GE were the close-ratio five-speed stick and the four-speed automatic. A full description of the 4A-FE and 7A-FE engine is at the Toyoland site. 1998 models benefitted from a new engine family, the ZZ, which used an aluminum block with iron cylinder liners, a weight-saving open deck, and a full-size main bearing girdle to strengthen the bottom end. The 1ZZ-FE had a long stroke to help with torque (79 mm bore x 91.5 mm stroke), with twin overhead cams and four valves per cylinder. The heads’ tapered squish area design forced a mixture of fuel and air at the spark plug, allowing a high compression ratio of 10:1 on regular gas. While every fuel injector had fired at once on the 4A-F, with two at a time on the 4A-FE (so one was firing against a closed valve), the 1ZZ-FE and newer engines fired each injector, only when the intake valve for that cylinder was open. Likewise, the electronic ignition of the 4A gave way to direct ignition on the ZZ and later engines. All of them had an aluminum-alloy block and head, with steel cylinder liners, and dual overhead camshafts. The 1ZZ-FE brought Corollas substantially more power and economy; it debuted with 120 horsepower at 5,200 rpm, and 122 pound-feet of torque at 4,400 rpm. That was more power than the 7A-FE, at lower engine speeds, so that the Corolla was peppy at all engine speeds. Eventually, the 1ZZ-FE would reach 130 hp and 125 lb-ft of torque. The valve seats were sprayed on, rather than pressed into the head, so they could be much thinner and transfer heat more effectively to the head; that meant less heat reaching the valve stems, allowing thinner, lighter valve stems and, in turn, thinner cam lobes, which cut parasitic losses and allowed both cams to be driven by a quiet, compact single-roller timing chain. The fuel injection was returnless, with a pressure regulator in the gas tank, reducing fire risk and making combustion more efficient. The catalytic converter was moved closer to the engine for greater efficiency, which required moving the aluminum intake manifold was moved to the front of the engine. Long intake runners, made of extruded aluminum (smoother than castings), increased low-rev power. The second-generation ZZ engine showed up in the 2000 Corollas; it added variable valve technology (“VVT-i”), which brought a five horsepower gain along with an extra 2-3 mpg. The 2000 Celica GT ushered in a high-performance version, boasting 180 hp; that tune made its way to the 2003-08 Corolla. The largest difference between the two were short, resin runners optimized for high-end horsepower; the variable valve timing system also changed lift on the 180-horse version. 2003 saw yet another major advancement, this one in gas mileage. Though the 2003 Corolla added both weight and a little horsepower - another 5 hp, making it 130 in total with 125 lb-ft of torque - gas mileage actually increased. The USA version could not use direct injection, which was used in Japanese versions, because of sulfur in the gasoline. Peak torque came at 4,400 rpm for the 2ZR-FE and 1NZ-FE, and at 4,000 rpm for the 2ZR-FAE. 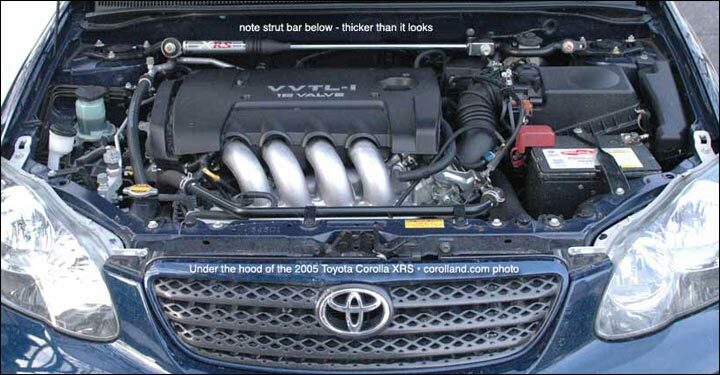 The 2009 Corolla XRS switched from the Celica engine to the Camry’s four-cylinder; horsepower went from 180 to 158, but there was better midrange power. Torque was rated at 162 pound-feet. Two versions of the basic 1.8 liter engine were available on the 2018 Toyota Corollas. The standard motor, available on all but LE Eco, was the continuing 2ZR-FE — a 1.8 liter four-cylinder with dual overhead cams and four valves per cylinder; it had an aluminum alloy block and head, and displaced 1,798 cc. Intelligent variable valve timing was used on both the intake and exhaust valves; the engine had sequential multiple-port fuel injection and direct ignition, and ran on regular fuel. The LE Eco used the new 2ZR-FAE, with the main difference being the use of the “Valvematic” system. Valvematic sounds completely new, but appears to be an extension of the “VVT-i” intelligent variable valve timing system which has a wider range of lift and phasing on the intake valve side. The two-liter M20A-FKS engine was a new design, using a lighter resin cylinder-head cover, more rigid crank, and, despite the higher displacement, smaller size and less weight. The D-4S fuel injection system used direct injection or low-pressure port fuel injection, depending on driving conditions; it had dual variable valve timing, with the intake controlled by an electric motor and the exhaust controlled by hydraulic pressure. The two-liter displacement was achieved with a longer stroke; extra efficiency was gained with up to 13:1 compression. An enlarged valve nip angle and laser-clad valve seat increased tumble and air volume; pistons with a round top surface and slanted sidewall helped tumble and reduced knocking (allowing higher compression) while reducing friction. There were other changes, as well. There were now three oil jets per cylinder, to reduce knocking, friction, and oil use; and a drain path within the crankcase, to return oil from the cylinder head, resulting in less oil agitation from the crankshaft. The rods were made of high-strength steel for lower weight, and the cam had a concave profile to increase valve lift. There were clever changes to the transmissions as well. The six-speed “intelligent manual” automatically revved the engine to match post-shift speeds; it dropped 15 pounds to come in at 88 pounds; and was 0.94 inches shorter. The K120 CVT, meanwhile, had a special launch gear, so that, when starting from a full stop, the launch gear was used — eliminating the sluggish feel of the CVT, and allowing a much higher range of gear ratios (to ann impressive 7.5). The use of a separate launch gear also reduced the input load, so the belt and pulleys could be downsized, and the belt angle narrowed, resulting in 20% faster “shifts.” The CVT now emulates a ten-speed rather than a six-speed and has a sport mode. This is the world’s first CVT+launch gear combination.